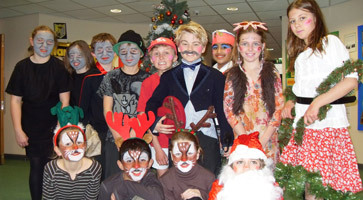 Junior School pupils performed their version of The Twelve Days of Christmas for parents, family and friends. The whole school had a part to play in the production which told the tale of two neighbouring families, the Christmases and the Grimgrumps. This traditional, heart-warming story of good versus evil ended with both families being best friends and enjoying entertainment by Mr Partridge’s Amazing Performing Troupe! Some of the main characters are pictured back row (L-R) Louisa Newton, Laura Memmott, Philip Curran, Lucas Fallon, Andrew Robinson, Edward Clark, Vidya Premraj, Isobel Gilmour and Amy Gratton. Front row (L-R) Hannah Marriott, Aadarsh Nemana, Isobel Mowatt and Elliot Abrahams.